Two days ago BitPay, the largest payment processor in the cryptocurrency space, published a new infographic filled with a number of new stats. This number is dropping as adoption increases and Bitcoin moves from an investment commodity to a payment method. At best that is just a guess. While it is neat that BitPay is one of a very few companies in this space willing to publicly release some numbers, we cannot determine what the actual cause for this trend with the available information. Correlation (drop in prices or average order value) does not mean the real cause is payment adoption. The fall in the average order value seems likely to be attributed to the increase in difficulty and the fall in the number of home miners. Unless they publish weekly or monthly bar charts (which they used to), or what merchants are their largest by volume each week, it is unclear what could be skewing that number (e.g., large block sales from miners in 2013 and 2014?). Are there any other numbers? Above is the last known public chart of BitPay transaction volume. The dates on the chart corresponds with April 2013 – March 2014 and the image comes from the Cryptolina conference held in August 2014. Although the quality is a little fuzzy, transaction volume appears to have reached around 70,000 in March 2014. Token prices during March ranged from approximately $450 – $650 which they likely weighted and multiplied by the total amount of bitcoins received each day to come up with a figure of $1 million processed each day (note: at the end of May 2014, BitPay announced it was processing $1 million in bitcoins a day). Yet as we shall see, in terms of fiat transaction equivalent, there is less than half as much today as there was last year. The chart above is part of the original BitPay infographic released on Wednesday. In terms of transaction volume, bitcoin mining alone accounts for the next 4 largest segments combined. For those who believe this will change in the future, recall that if mining somehow becomes cheaper then it is also cheaper to attack the network. So as long as there are rents to be extracted, miners will continue to fight for and bid up the slivers of seigniorage up to where the marginal cost eventually reaches the marginal value of the token; and that translates into continuous streams of mining revenue (not necessarily economic profit) that are converted into fiat to pay for land, labor, taxes and electricity. Furthemore, because bitcoin mining is not on the top 5 list of in terms of number of transactions this likely means that the miners that do use BitPay likely sell large blocks and are therefore large manufacturers or farms or both (and of those miners, most probably come from large entities such as BFL and KnC paying their utility bills). The second chart to the right states that gift cards as a class represent the lion share for number of transactions processed. This is actually kind of humorous and unhumorous. What this means is that the majority of BitPay users (and probably bitcoin users in general) are not doing economic calculation in BTC (the unit of account) but instead some kind of fiat. And to do so, they are going through a Rube Goldberg-like process to convert bitcoins into fiat-based utility. This is mostly borne out through a roundabout process such as bitcoins sent to Gyft -> Gamestop -> ShellCard (the gas company). Or Gyft->Amazon->Purse.io. What are other motivations? Some users, based on social media posts, claim to do this in order to reduce identification (KYC) paper trails so taxes will not have to be declared and sometimes to take part in illicit trade (e.g., sell these gift cards at a discount for actual cash for illicit wares). Based on their chart, roughly $345,000 of merchant activity is processed on a daily basis. Of that, $277,000 comes from precious metals and bitcoin mining. The remaining $68,000 is for unidentified e-commerce, IT services and travel. Or in other words, nearly 80% of bitcoins processed by BitPay in 2014 went to paying for security (mining) and buying (or selling) gold and silver. Perhaps those volumes will change, but according to the chart above, that does not appear to be the case. And as discussed in Slicing Data, the noticeable pattern of higher activity on weekdays versus the weekend is apparent irrespective of holidays with Coinbase too. Consequently, on most days these self-reported numbers comprise between 3-5% of the total transactions on the Bitcoin blockchain. However, as Jonathan Levin, has pointed out, it is not clear from these numbers alone are or what they refer to: Coinbase user to user, user to merchant, and possible user wallet to user vault? What does this mean for BitPay? BitPay has three tiers of customer pricing. The first plan is free, the second charges $300 for the first month and the third is for enterprise clients. They claim that there are no transaction fees at all. While they probably do sign up customers on their 2nd and 3rd tier, it is unclear how much. Speculatively it may not be very much due to the low transaction volumes overall (e.g., why would Microsoft pay more in customer service than they generate in actual revenue?). Thus their margins may be razor thin at ~1% which translates to roughly $1.5 million in annual revenue (it has to be below 2-3% otherwise merchants would not perceive an advantage for using their service). BitPay also charges (collects) a spread through a process called the BitPay Best Bid (BBB) rate. Based on the current head count of between 70-100 people (9 were probably laid off after the “Bitbowl“), it may be the case that the revenue generated annually covers the labor costs for just one or two months. Perhaps this will change if prices rebound and/or if volume increases (recall that payment processors sometimes have to put coins on their books if they cannot find a counterparty to sell to in the time frame so in the likely event that BitPay holds coins on their books, they can gain or lose through forex movements). On this point, four months ago I was involved in a mini-twitter debate with Jeff Garzik (a developer with BitPay) and Antonis Polemitis (an investor with Ledra Capital). It partially centered around some of the findings that Jorge Stolfi (a computer science professor in Brazil) posted the previous month regarding BitPay’s transaction volume. How do we know this? 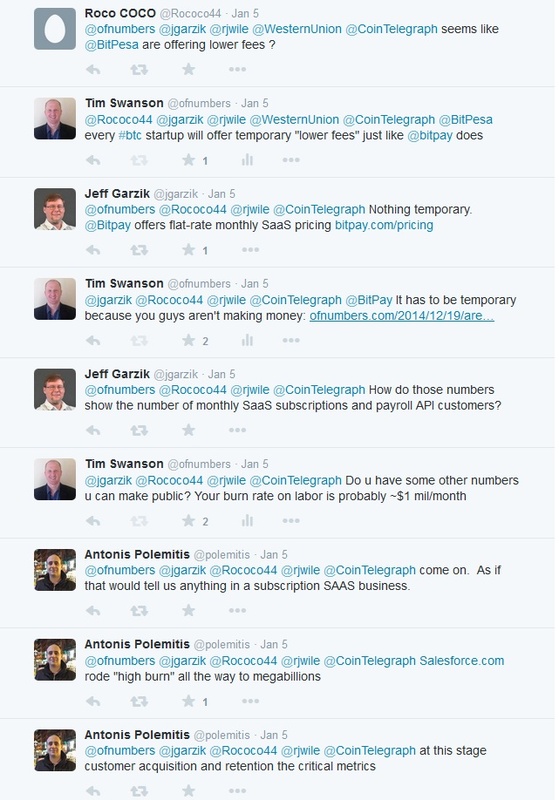 Again, why would Demandware pay more for a SaaS subscription than they generate via revenue? Altruism? Perhaps a few do (like NewEgg or TigerDirect) but even if 1,000 customers paid $300 a month, that is still just $300,000 a month far less than the $1 million (speculatively) needed to cover labor alone. I contacted Fabio Federici, co-founder of Coinalytics which specializes in building data intelligence tools to analyze activities on the blockchain. Using data from WalletExplorer.com (which identifies reused addresses of payment processors, pools, gambling services and such), his team was able to create visual aides covering BitPay. It bears mentioning that there is a ~10% discrepancy between the WalletExplorer numbers and BitPay and this is likely a result of the clustering heuristic (by WalletExplorer) which will not give 100% coverage and is not dishonesty from BitPay (e.g., WalletExplorer data set identifies just over 600,000 transactions last year whereas BitPay cites roughly 650,000 transactions). The time frame for the chart above takes place between July 2, 2011 and April 13, 2015. The chart visualizes the Daily Number of Transactions. 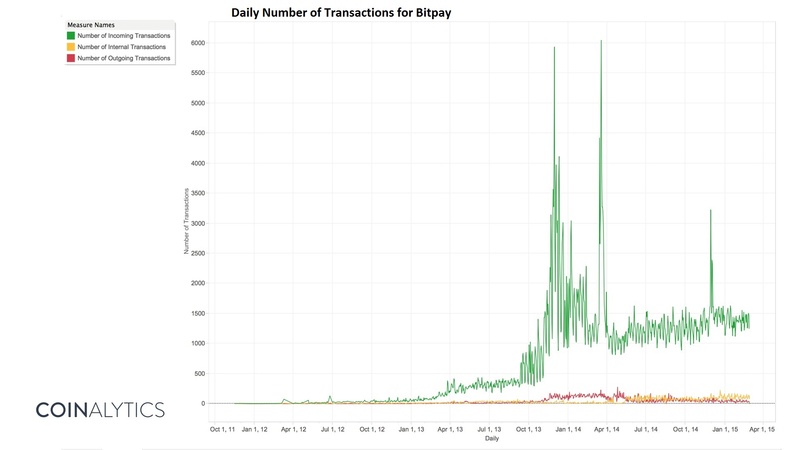 The green line is the important line as it represents the incoming transaction amount that BitPay receives each day. It shows that aside from a brief outlier in the winter of 2014, volume has remained relatively flat at around 1,200 – 1,500 transactions per day for the past 15 months. The time frame for the log chart above is slightly shorter, between January 1, 2013 and February 28, 2015 (there is a strange drop starting in March that is likely a problem with the clustering heuristic, so it was removed). 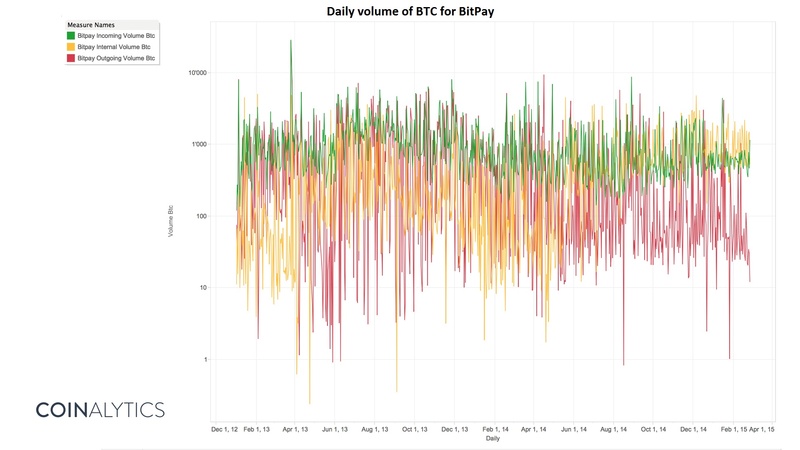 The chart visualizes the Daily Volume of bitcoin that BitPay receives. The green line is the important line as it represents the aggregate of how many bitcoins BitPay received each day. While there are some days where the total reaches to 8,000 or even 9,000 bitcoins, these are outliers. Conversely some slower days reach around 500 bitcoins per day. On average, between January 1, 2013 and February 28, 2015, the daily amount is 1,138 bitcoins. One explanation for the discrepancy is that there is a large incoming transaction of 28,790 bitcoins on March 25, 2013 which skews the average in the first date range. It the same day that the Cyprus international bailout was announced. While this coincides with the ‘bull run’ in the spring of 2013, it is unclear from public data what this one sale may have been. Looking at some other charts, at around that date roughly 52,694,515 bitcoin days were destroyed (BDD) and total output volume (TOV) was around 4 million (which is about 4x higher than today). During this time frame fees to miners were also about 3x-4x higher than they are today. And on this specific day, 159 bitcoins in fees were sent to miners, the fifth highest total ever. While speculative it could have been an “early adopter” or even a company overseas cashing out (market price was around $73.60 per bitcoin on March 25, 2013). 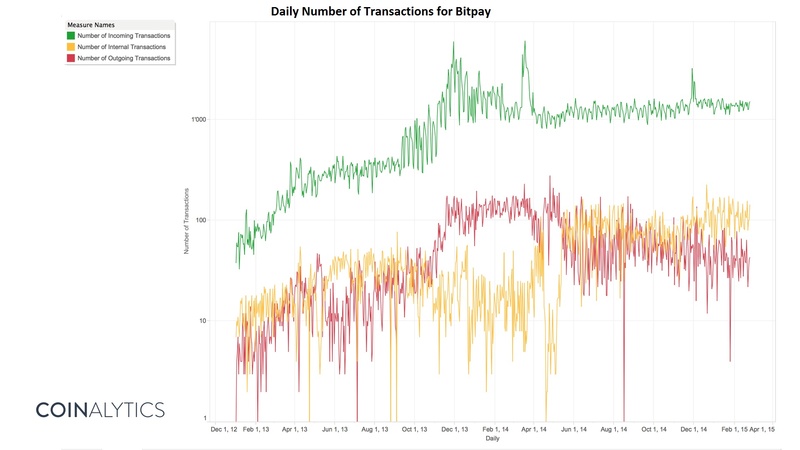 The log chart above visualizes the daily number of transactions for BitPay between January 1, 2013 and February 28, 2015. The interesting phenomenon is the flip that occurred in the fall of 2014. Whereas previously the number of outgoing transactions exceeded the internally held coins, in late September this appears to have changed. It is unclear what the reason(s) for this is. Perhaps more merchants decided to keep coins instead of exchanging for fiat. Or perhaps due to the continued price decline, BitPay had to hold more coins on their balance sheet due to the inability to liquidate merchant requests fast enough (e.g., between August 1 – November 1, market prices declined from around $558 to $336 per bitcoin). Other noticeable phenomenon on the green line above include a rapid run-up during the collapse of Mt. Gox in February 2014 and then later Bitcoin Black Friday followed by Cyber Monday in November 2014. Why are there recognizable patterns for the green line in all of the charts? Again, since the bulk of payments are related to mining, it is likely that miners sell blocks on a regular basis. Denominated in USD, when paired up with bitcoin volume between February 2013 and February 2015, the plot would likely look like a left-modal bell curve. 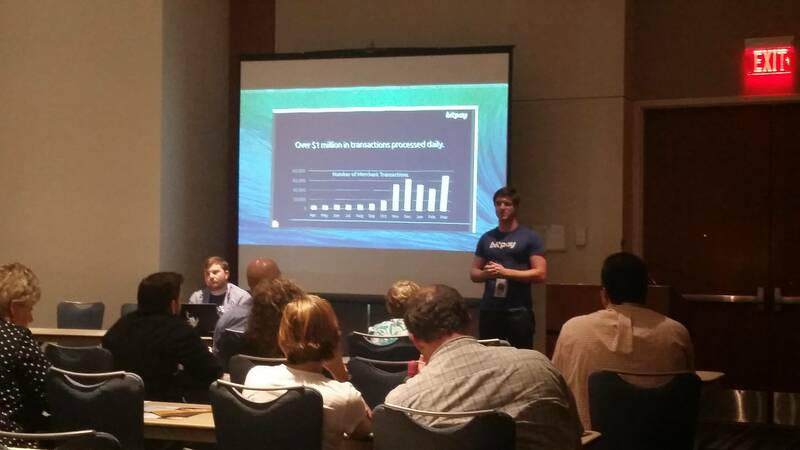 On average BitPay processed 1,544 transactions worth $435,068 per day in 2014. Once mining and precious metals are removed, the BitPay “economy” involves $57.5 million per year. Even if the full amount, $158 million, were classified as actual economic activity, it is less money than what Harvard Business School generates from selling case studies each year (~$200 million) or roughly the same amount that the University of Texas athletic department generates each year. If Coinbase and the rest of the bitcoin-to-fiat merchant economy sees similar patterns of activity, that would mean that above-board economic “activity” may currently hover around $350 million a year. This is just slightly more than venture capital was invested in the Bitcoin space last year (~$315 million) and roughly equivalent to the fund that Lux Capital raised last month for funding science-related startups. For comparison, Guatemalan’s working abroad remitted more than $500 million back to their families in one month alone last year. In terms of payments the competitive landscape for Bitcoinland is not just other cryptocurrencies but also incumbent payment providers and tech companies such as Google, Apple, Facebook and Microsoft (the latter has been collecting money transmitter licenses), each of which has launched or is planning to launch an integrated payments system. Startups such as Venmo and Square, both of which were launched the same year as Bitcoin, have seen some actual traction. For instance, in the forth quarter of 2014 Venmo payment volume came in just over $900 million, up from $700 million processed in the third quarter (Square Cash claims to have an annualized volume run rate of $1 billion). And although it is not a completely fair comparison, Second Life from Linden Lab is still around “with 900,000 active users a month, who get payouts of $60 million in real-world money every year” (note: there is some debate over specific user numbers). When mining payments are removed, Bitcoin, as an above-board economy, appears to generate less in return than the venture capital funds have gone into it (so far). Perhaps this will change as more of the capital is deployed but it may be the case that Bitcoinland cannot securely grow exponentially (as the bullish narrative envisions) while maintaining a fixed amount of outputs. As bitcoin becomes a more established technology, we expect to see more consumers using it. The investors are usually the first ones to hop on new technology, but as bitcoin circulates more, and as the amount of transactions increases, we should see bitcoin being used by more and more average consumers. We see bitcoin being used in emerging markets as a supplement to the current banking and monetary systems. Bitcoin breaks down the barriers to financial tools that many people in emerging countries are facing. Empirically, regarding “more consumer using it,” this does not seem to be true. Nor is there evidence that bitcoin is circulating “more” — in fact, based on age of last use, more than 70% of coins have not moved in more than 6 months (slightly older figure). And while cryptocurrencies may play a role in developing countries, so far there is little evidence this is actually occurring beyond talk at conferences. Again, perhaps this will change as new data could reinforce Vonk’s narrative, but so far that is not the case. One thing that I did notice is that their earlier “incoming” graphs all look highly correlated to the transaction volume in the Bitcoin network after long chains are removed. This gets back to the usual Bitcoin transaction volume question of what’s really in a transaction and what’s change? It seems their transaction volumes have really only crept up in the last 12 months, much slower than the rate of growth in transactions (or non-long-chain transactions) on the main network (increased competition?). What does this look like? 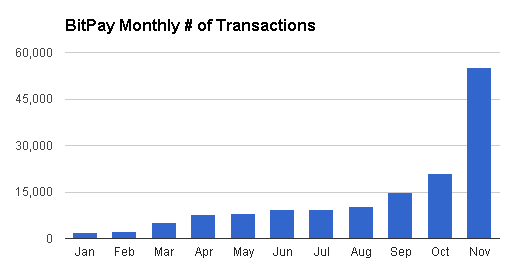 The chart below measures Number of Transactions Excluding Chains Longer Than 10 between April 2013 – April 2015. What are long chains again? Rather than rehashing the entire paper, recall that in Slicing Data, it was observed that a significant fraction of total transaction volume on any given day was likely inflated through a variety of sources such as faucets, coin mixing and gambling. As we can see above, while there is indeed an upward trend line over the past two years, it is clearly not growing exponentially but rather linearly, and particularly in spurts around “macro” events (e.g., bubble in late 2013 and collapse of Mt. Gox). Based on the public data from address clustering, consumer adoption is empirically not growing near the same level as merchant adoption. In fact, consumer adoption in terms of actual non-mining, retail-usage, has basically plateaued over the past year. We know this is the case since merchants accepting bitcoin for payments has roughly quintupled over the same time frame (20,000 to 100,000) and includes several large marquis (such as Microsoft) yet without any surge in usage by bitcoin owners in aggregate. Other companies that have actively promoted bitcoin for payments have likely also been impacted by sluggish sales. For instance, in February 2015, Overstock.com (which has been using Coinbase as a payment processor for over a year) tried to obfuscate weak traction by using a strange method: measuring orders per 1 million residents. 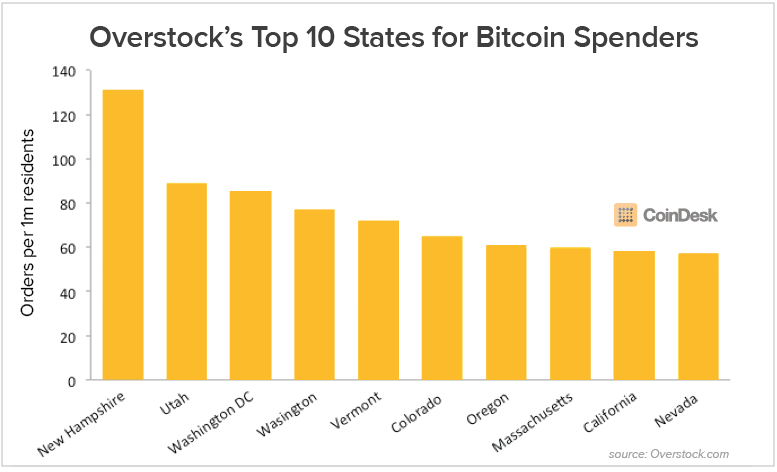 New Hampshire has a population of 1,326,813 and according to the chart above Overstock received 131 bitcoin orders per million residents. This comes out to roughly 175 orders in 2014. Utah has a population of 2,949,902 and according to the chart, Overstock received 89 bitcoin orders per million residents. This comes out to roughly 270 orders in 2014. Washington D.C. has a population of 658,893 and according tot he chart above Overstock received 85 bitcoin orders per million residents. This comes out to roughly 56 orders in 2014 (although if the greater D.C. metro population was used, the order number would be about 9x larger). Fighting for last place: Puerto Rico trounced Mississippi, which came in dead last. Puerto Rico has a population of 3,667,084 and according to the report, Overstock received 12 bitcoin orders per million residents. This comes out to about 44 orders in 2014. In comparison, Mississippi, with a population of 2,994,079 had 8 order per million residents. This comes to about 24 orders. According to Overstock, in 2014 approximately 11,100 customers paid with bitcoin at both its US and international websites. Altogether this represented roughly $3 million in sales which when coupled with low margin products (based on the top 10 list of things sold on Overstock) is an initiative that Stone Street Advisors labeled “distracting” (see slides 21, 32, 33, 37, 58). In addition, since gift cards represent about 16% of all transactions processed by BitPay, they can be added to the list of non-negligible reasons for fluctuation in blockchain transaction volume. That is to say, on any given day there are roughly 242 gift card related transactions through BitPay which should appears on the blockchain. This is about the same amount of Counterparty transactions that may take place on a slow day. Thus, as discussed in Slicing Data, the daily components of blockchain transactions are likely: faucet outputs (which may be “long chains”), mining rewards, some retail activity, coin mixing, gambling, watermarked assets (e.g., Counterparty, Mastercoin), P2SH, movement to ‘change’ addresses, wallet shuffling and now gift cards. Perhaps all of this will change and this snapshot is “too early” as the bullish narrative claims. Trends may change, no one has a crystal ball. Share the post "A gift card economy: breaking down BitPay’s numbers"
This entry was posted in Bitcoin, Cryptocurrency, Economics, IT, Market research, Science & Technology by Tim Swanson. Bookmark the permalink. Do an extra check on profitability of hydro in Washington. They have the lowest electricity rate there because the state is subsidising electricity prices. That’s how they can provide the cheapest electricity in the states. They actually charge less than the actual cost of generation even for hydro. So the people mining there are most likely leeching of the tax payers rather than providing revenue for the hydro industry. The electricity market is a bit tricky as well since allocation of power is far from trivial. Anyway, I agree with the overall conclusion. During the gold rush, the people who sold shovels was making the money. Same seems to be true for digital gold.